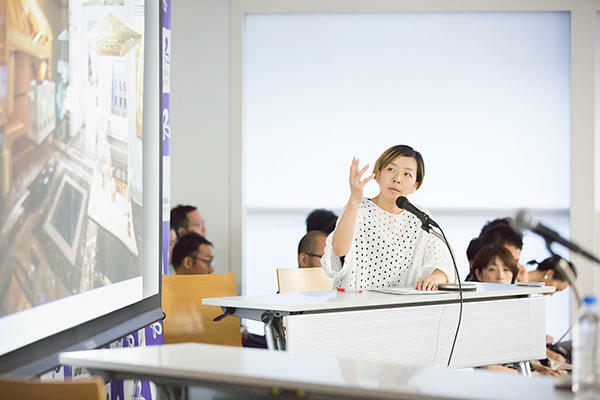 On July 27, 2016, a briefing session was held at the Japan Foundation Hall "Sakura" to present the exhibition at the Japan Pavilion conducted as part of the 15th International Architecture Exhibition of la Biennale di Venezia. The exhibition at the Japan Pavilion titled en: art of nexus was curated by Professor Yoshiyuki Yamana of the Department of Architecture and Building Engineering, Faculty of Science and Technology at the Tokyo University of Science and produced by filmmaker Seiichi Hishikawa, editor Masaki Uchino, and urban space theory researcher Masatake Shinohara. It showcased works of 12 groups of architects with experience in designing shared houses and community spaces. The venue design was created by teco. The main staff alone exceeded 30 people who worked relentlessly to create this exhibition at the Japan Pavilion with en (which has several meanings in Japanese: connections, relation, ties, chance, edge, fringe, and rim) as the theme. The exhibitors examined the social conditions in Japan since the beginning of the 21st century and especially in the aftermath of the Great East Japan Earthquake and the need for connections and sharing experienced by many Japanese people in the context of three themes--"The en of People," "The en of Things," and "The en of Locality"--and presented works built over the past few years that are actually being used. The overall theme of this year's Biennale di Venezia was "Reporting from the Front." The relevance of the exhibition at the Japan Pavilion, which showcased actual examples of projects for creation and revitalization of communities implemented in various areas in Japan, was highly praised and the Japan Pavilion was awarded a Special Mention. 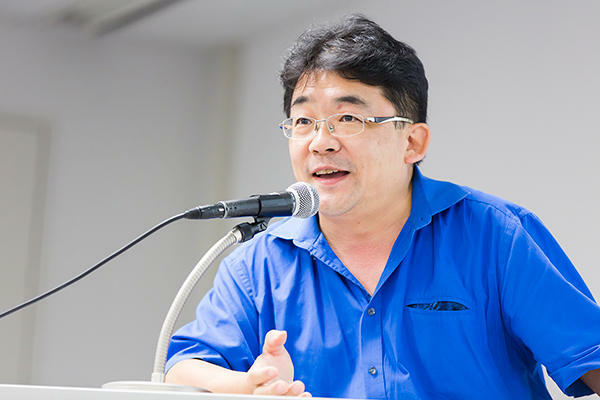 The briefing session consisted of an overall report delivered by Professor Yamana, a screening of a documentary video recording the process of setting up the exhibition created by Seiichi Hishikawa, and a special screening of the greeting movie of the Japan Pavilion, followed by various reports regarding the exhibition. Filmmaker Hishikawa, who vividly depicted the conceptual image of the Japan Pavilion through footage of natural scenery, rituals, and the everyday life of people across Japan, also engaged in the creation of visual images for the installations of other exhibitors. For instance, the visual images created by Hishikawa for Fudomae House, a shared house also known as "The House for Seven People" designed by mnm (Mio Tsuneyama), expressed the changing natural light streaming through the entrance of the actual building. At the exhibit of the Kamiyama-cho Project implemented by BUS (Satoru Ito, Kosuke Bando, and Issei Suma), the dynamic nature of the project, which emphasizes the concept of urban development and community building through architecture, was presented in a three-dimensional format by projecting images on the front, back, left and right walls, thus giving visitors the opportunity to experience for themselves the unique space and time characteristics of the project. The visual images created by Hishikawa played an important role as tools used to give physical shape to the intangible nature and functionality of each architectural structure. 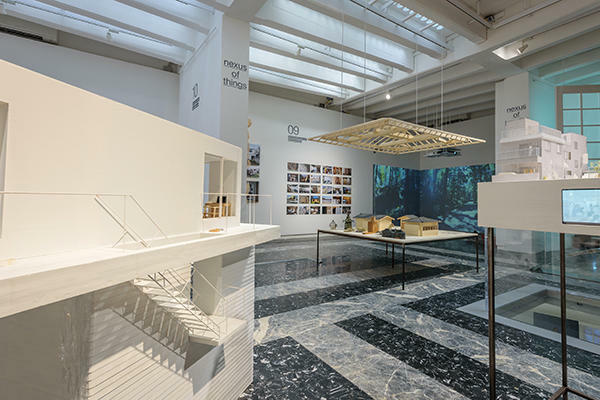 Particular attention was given to the task of presenting the elements of Japanese architecture not simply through models and photographs, but by physically bringing them into the venue in Venice. The efforts to achieve this task are reflected in the venue design created by Chie Konno and Rie Allison of teco. 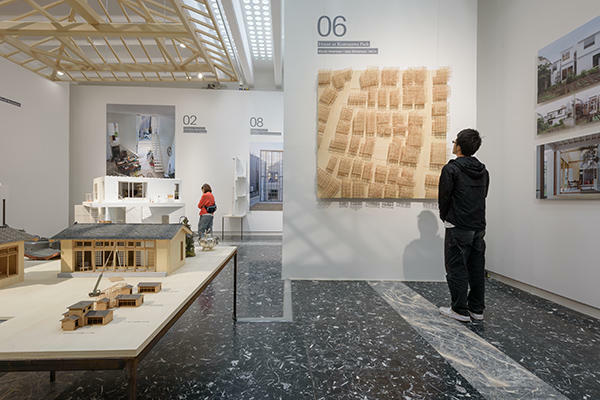 The two architects explained that as they strived, through a process of trial and error, to determine the direction of the exhibit, they were deeply impressed by the attitude of the exhibitors who worked to redefine the relationship of architecture with society with focus on the cultural significance of buildings, economic activities, and local resources. Chie Konno (CK): We decided that instead of applying conventional formats to showcase the concept of en, which matched the overall theme of the Biennale, we wanted to present it as a flexible space of collective intelligence. The four wall pillars of the Japan Pavilion designed by Takamasa Yoshizaka are an important feature of the building. We decided to divide the interior space into the three themes of "people," "things," and "locality." At the same time, we designed the space so that it allowed the exhibited works to expand, transcend their themes and overlap. We aimed to create a space without a set route for viewing the works, which visitors could freely explore as they put together the different elements of en. Also, we strived to adapt the theme of the exhibition to the specific design of the Japan Pavilion by underscoring the connectivity in the internal spaces exemplified by the natural light reflected from the ground into the cylindrical "well" in the heart of the building that is linked with the pilotis (an open ground level attained by raising an architectural structure on columns) beneath the Japan Pavilion and the clearly audible voices of the people gathered in the pilotis. 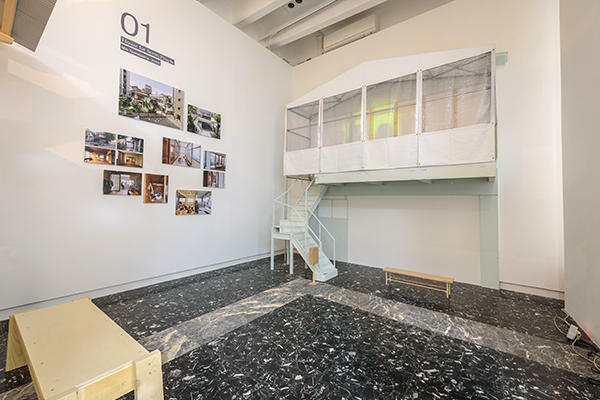 Located in the Giardini, the venue of la Biennale di Venezia, the Japan Pavilion is known for its unique style featuring a shared space that smoothly links interior with exterior through the pilotis structure. The team of this Biennale reinvented the pilotis as a traditional Japanese engawa (veranda), converting it into a space for encounters and relaxation decorated with dividers that apply the renowned technique for lattice used in Tochigi Prefecture and newly-planted greenery. CK: The structure, which enabled visitors at the Japan Pavilion to gaze out to other pavilions, or to freely drop by while enjoying a walk, embodied the connectivity and relevance symbolized by the concept of en. We managed to realize a design that maintained the connection between the exhibition on the upper floor and the exterior and converted the entire space into a presentation. Next, the 12 groups of participating artists delivered brief reports about their exhibits. The participants in "The en of People" part of the exhibition were mnm (Mio Tsuneyama) with Fudomae House, Osamu Nishida＋Erika Nakagawa (Osamu Nishida and Erika Nakagawa) with Yokohama Apartment, Naruse Inokuma Architects (Jun Inokuma and Yuri Naruse) with LT Josai, and Naka Architects' Studio (Toshiharu Naka and Yuri Uno*) with Apartments with a Small Restaurant. The exhibition of shared houses and apartments with restaurants and shared spaces that can be used by people in the community demonstrated various practical attempts to create structures that do not fragment individual lifestyles. The presentations used in the exhibition did not simply rely on architectural models, but adopted diverse approaches, such as video footage, photographs, and installations that recreate the environment of the actual structures. The exhibitors in "The en of Things" part of the exhibition were Nousaku Architects (Fuminori Nousaku* and Junpei Nousaku) with Guest House in Takaoka, miCo. (Mizuki Imamura and Isao Shinohara) with House at Komazawa Park, Levi Architecture (Jun Nakagawa*) with 15A House, Shingo Masuda + Katsuhisa Otsubo Architects (Shingo Masuda and Katsuhisa Otsubo*) with Boundary Window, 403architecture [dajiba] (Takuma Tsuji*, Takeshi Hashimoto, and Toru Yada) with The Floor of Atsumi, and Koji Aoki Architects (Koji Aoki) with House in Chofu. 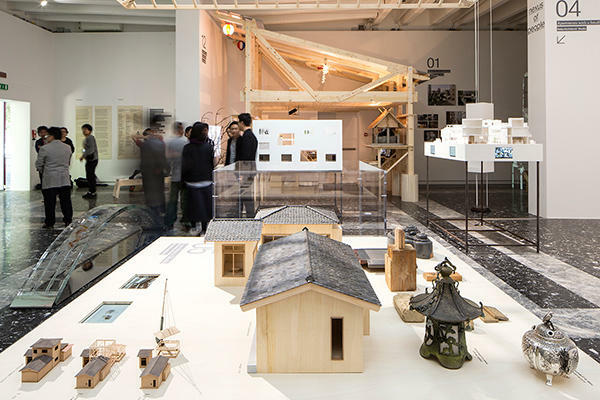 These works, which feature renovations of existing structures, innovative application of widespread Japanese architectural models, re-use of old materials, and other approaches that place the focus on the specific material nature of "things," are excellent examples of the networks of people and things formed in the course of the creation process. In this sense, "The en of Things" and "The en of People" are themes that share similar roots. The participants in the last part of the exhibition, "The en of Locality," were BUS (Satoru Ito, Kosuke Bando, Issei Suma) with the Kamiyama-cho Project, and dot architects (Toshikatsu Ienari*, Takeshi Shakushiro*, Wataru Doi) with Umaki Camp / Beat Shrine. Their works drew attention to the initiatives implemented by architects in local communities. As a theme, "The en of Locality" is closely linked with the involvement of architects and artists with local communities, an involvement which has grown quite active in recent years, and with the new trend for people to move their living environments from urban to rural areas. Initiatives to attract creative and IT companies to relocate their offices to rural areas using the know-how and technology of architects are perhaps the most cutting-edge efforts currently under way to link industry and local culture through the means of architecture. Emotional response to the words "There is architecture here"
Professor Yamana, the curator of the Japan Pavilion, supervised the overall flow of the briefing session and offered the following summary of the exhibition. Yoshiyuki Yamana (YY): Even today, in 2016, the image that Europe has of Japanese architecture is dominated the period of high economic growth exemplified by the works of Kenzo Tange and the so-called Metabolist movement. There must be, however, a significant gap between that type of modern architecture and the mentality of architects who are currently creating their works in Japan. Instead of upholding large slogans and building structures that will fulfill the goals in these slogans, it is perhaps necessary to consider the role of architecture on a smaller social scale, or, in other words, in the context of its relationship with local communities and individuals. Based on this idea, we came up with en as the theme of the exhibition. Judging by the response of the local communities, however, I am inclined to think that this contrasting relationship is not entirely off the mark. Most Western countries participating in la Biennale di Venezia chose to respond to the overall theme "Reporting from the Front" by generalizing the issues at hand. Curation-based upon such a concept tends to blur the functions and specific features of buildings. Therefore, I found the words "There is architecture here," said by a certain member of the Screening Committee during the screening process, as an enthusiastic response. 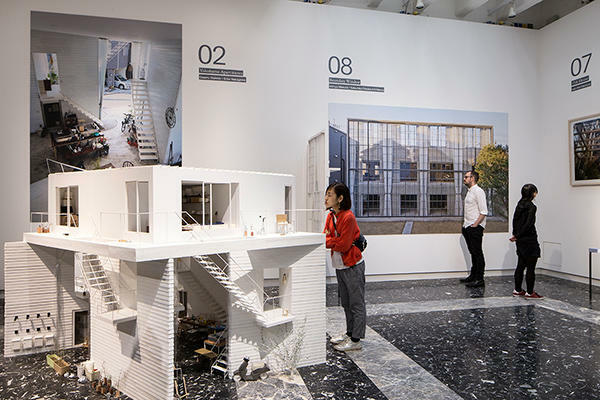 This year's Biennale di Venezia International Architecture Exhibition brought to the forefront the refugee crisis, a problem has confronted the entire European continent and the trial-and-error approach that we have adopted to deal with social uncertainties. 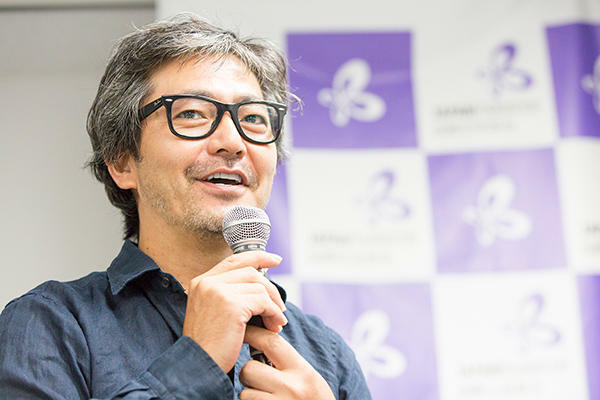 Making proposals about ongoing social issues for which there are no established solution methods is a trend that has also emerged at the International Arts Exhibition, which is held alternately with the International Architecture Exhibition, but as Professor Yamana pointed out, it is a framework that faces numerous issues in terms of specifics and applicability. Against this backdrop, the en: art of nexus was awarded a Special Mention because it succeeded in drawing attention to the efforts of individual architects and organizations who engaged in activities to solve the issues of "personal relations" and "urban/local cultural stagnation" that surfaced again in the aftermath of the Great East Japan Earthquake (or had been engaged in such activities even prior to the disaster). 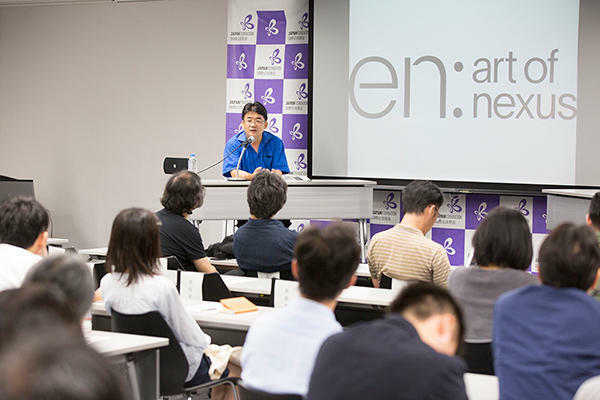 Another reason for the award is that such activities are by no means rare in Japan, a fact that was reflected in the unprecedentedly high number of artists--approximately 30 people--who took the stage in the briefing session. YY: The team that worked to realize the exhibition at the Japan Pavilion this year is quite numerous, enough to fill an entire large bus. I am extremely happy that this fact was recognized and praised. I am encouraged by the knowledge that, despite the extensive societal collapse that we are witnessing, the architects who participated in the project have an extremely positive vision and determination to rebuild society. I could feel the same attitude in young architects from Asia and South America as I saw their eyes sparkling with energy. The atmosphere at the Biennale made me realize that the Euro-centric perspective on architecture is undergoing a significant transformation. Inspirations from the Exhibition "How Did Architects Respond Immediately after 3/11--The Great East Japan Earthquake"
15th International Architecture Exhibition of la Biennale di Venezia.